Queen of Nanaimo in Long Harbour in the summer of 2017. The 53-year-old BC Ferries vessel, which is slated for retirement after completing duties on Route 9 this summer, has been plagued by mechanical issues. The Bowen Queen is being put into service today to replace the Queen of Nanaimo while a mechanical issue is fixed. The Nanaimo was removed from service Thursday due to a mechanical problem on the starboard controllable pitch propeller. Beginning with the 2:35 p.m. sailing from Long Harbour, the Bowen Queen will service all Queen of Nanaimo scheduled sailings through to the end of Monday, July 31. 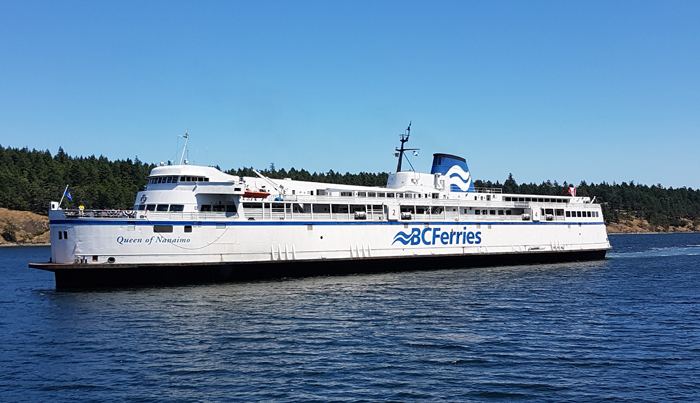 The Salish Eagle will continue to provide service on the Tsawwassen-Southern Gulf Islands route, whose summer schedule requires two vessels to maintain. Further updates will be provided as soon as more information becomes available. For the most up to date travel information, follow @BCFerries on Twitter. The Queen of Nanaimo was also out of service due to a controllable pitch propeller problem for several days beginning June 22. No replacement vessel was available at that time. The 53-year-old Nanaimo is due to be retired at the end of this summer.